Reconstruction of Tashkent streets and squares for the Independence Day celebration on the national leader's initiative is a tradition in Uzbekistan. Central part of the capital around Chor Su marketplace and Eski Juva square was reconstructed in 2005. 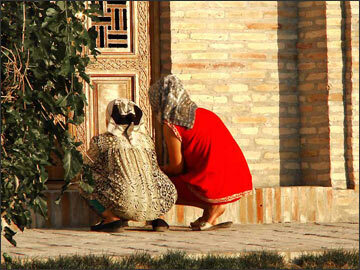 President Islam Karimov ordered the National Gallery of Fashion there rebuilt so as to resemble the famous ancient monuments of the Timurides era. Road bridges and interchanges were built in Tashkent for the jubilee in 2006. This year, it is the turn of the religious complex on Hazrati Imam square also known as Hast Imam. Buildings of the XVI-XIX centuries were restored there and new cyclopean ones built in a matter of months. The scope, plans, and tempos of construction were determined by Karimov himself. The construction was practically over a month before the Independence Day (September 1). 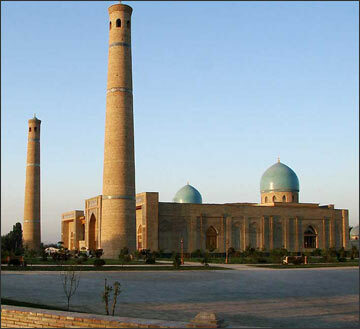 Located in one of the ancient areas of Tashkent, Hast Imam became famous in the X century as the burial site of Abu Bakr Muhammad ibn Ismail Kaffol Shoshi or Hazrat Imam, a Moslem saint and Shar'ah law scholar. His mausoleum attracted crowds of pilgrims. The mausoleum of Sujunch Khhoji khan, the first ruler from the Sheibanides dynasty, was built nearby in the XVI century. 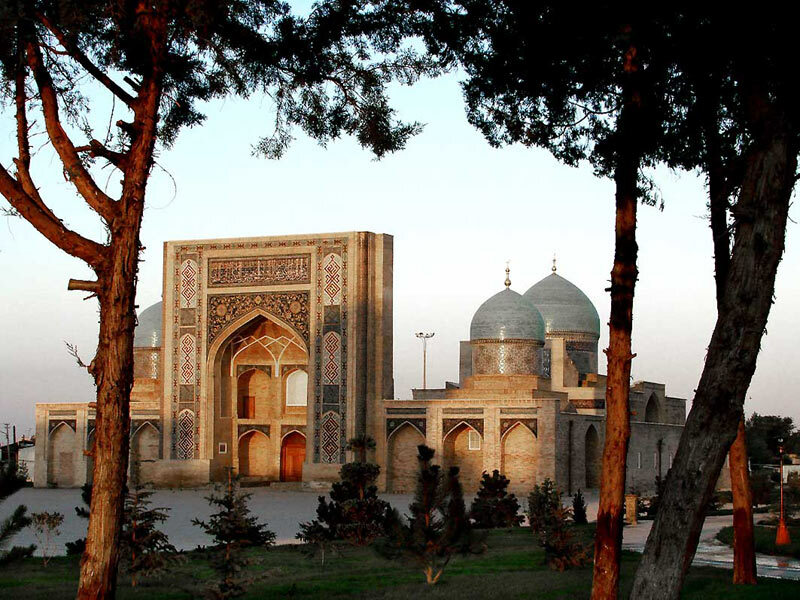 His son Navruz Ahmed Barak-khan had a grandiose medrese built next door to the family vault. The Muy Muboraq, a place where a hair of Prophet Mohammed is reputedly kept, became another shrine nearby. Two mosques (Tilla Shaikh and Namazgokh) were added to the architectural complex in the XIX century. When the Soviet authorities established the Religious Administration of Central Asian Moslems in 1943, Mufty Eshan Babakhan insisted on making Hast Imam the religious center. 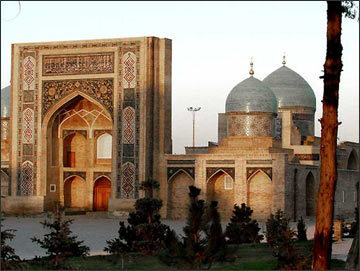 Restoration of the square began last autumn and the effort was doubled this February when ISESCO (International Islamic Education, Science, and Culture Organization) proclaimed Tashkent the capital of Islamic culture in 2007. In fact, it all but made Hast Imam number one construction site in Uzbekistan. Acting on Karimov's order issued on February 20, the Justice Ministry promptly registered Hazrati Imam Social Fund as the principal in the forthcoming reconstruction. The Finance Ministry was ordered to transact a sum equivalent to $500 million to it. Other major sponsors were found as well. Neftegazmontazh (a division of Zeromax, a company associated with the Karimovs' financial interests) was rumored to become the contractor. As if impatient, Karimov made two visits to the site within four months of intensive construction. Construction was therefore completed ahead of schedule, 1.5 months before the celebration. Narrow streets and buildings of clay gave way to vast spaces with lawns, lampposts, benches, and alleys. Pines and flowers were planted. Karokovus, the ancient ditch, was cleaned up and put into a bed of bricks (like the Shakhrud canal flowing through the center of Bukhara). A colossal mosque with two symmetric minarets was built on the side adjacent to Karasarai Street. 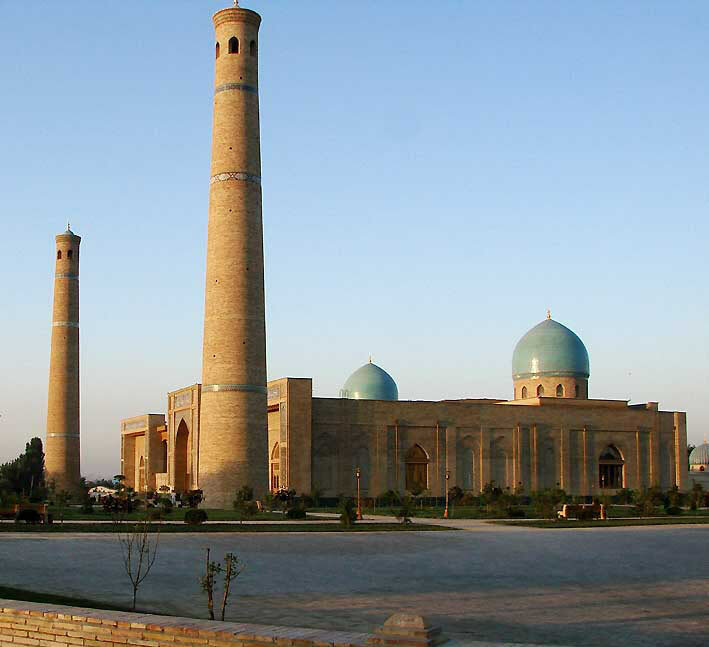 Ribbed tin roofs of the mausoleum cupolas were replaced with blue ceramic tile in imitation of the famous Registan Square in Samarkand. This mixture of styles on the other hand bears a strong resemblance to Mustakillik Square also in Tashkent. 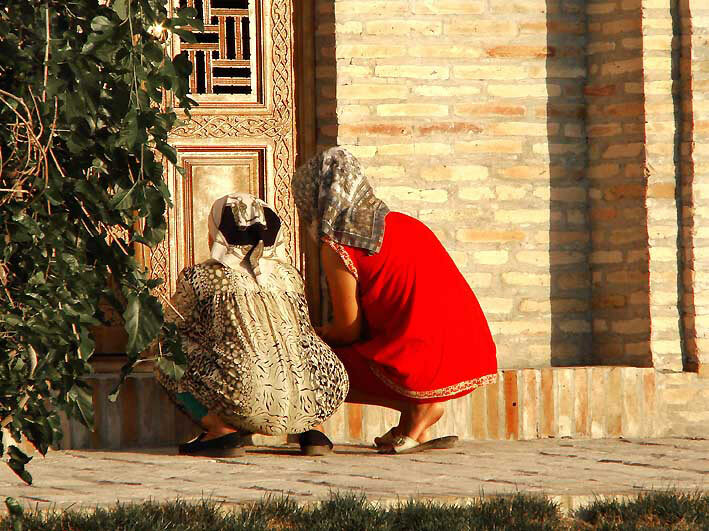 Tashkent old-timers and foreign tourists will probably find the restored Hast Imam too garish. They will say that the reconstruction has destroyed the aura of the ancient site. In the meantime, a radical reconstruction and renovation of sacred sites is actually a tradition. Eager to be remembered past their lifetimes, despotic and enlightened rulers of the past regularly launched similar efforts and strained their countries and peoples beyond endurance just to ensure a place in history-books and respect among contemporaries. Even the Shoshi mausoleum was built on the ruins of an earlier burial site dated the X century and reconstructed by the Sheibanides in 1541. The Barak-khan medrese was badly damaged in the earthquake in 1886 and escaped destruction in the first years of the Soviet power by nothing short of a miracle. 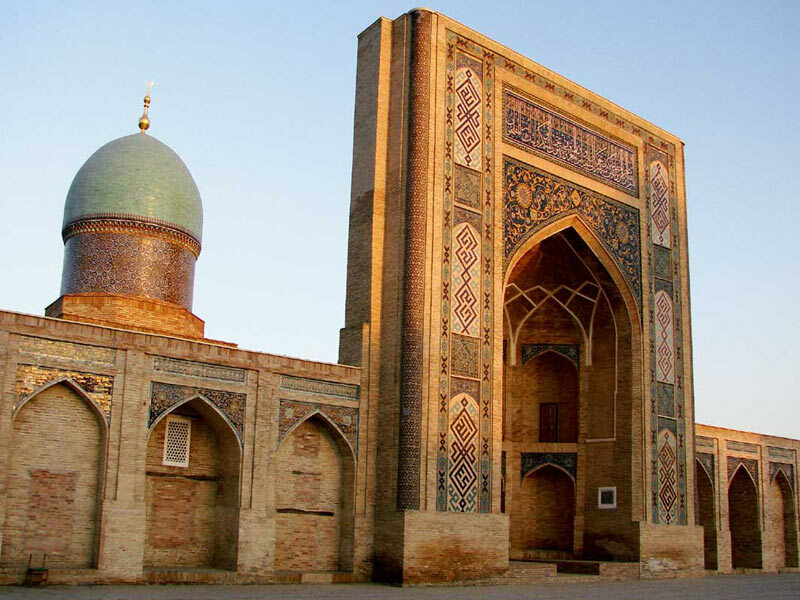 It was repaired and reconstructed in 1956-1963 with the consent of the then party elite of the Uzbek Soviet Socialist Republic. Ordinary citizens of Tashkent seem to like reconstruction projects resulting in new areas designed in what may be taken for a mix of national traditions and local ideas of progress and modern civilization. Every Friday, the new mosque on Hast Imam attracts the faithful by the thousand. Karasarai Street nearby is clogged with autos because very many come to worship from distant places. In fact, the first faithful turn up by the Shoshi mausoleum at 5 a.m. on workdays - so as to pray before the working hours.